Workout equipment can become tedious to use if they emit irritating noises. Treadmills should not create irritating screeches and squeaks, but you’ll find that treadmills that offer higher mph rates will usually create more noise when in use. If your treadmill is making noises on a regular basis not related to the speed, then you’re going to need to consider doing some maintenance. There’s nothing more irritating than hearing a symphony of irritably noises as you try and complete your workout. Luckily you can now purchase some of the best quiet treadmills online for a reasonable price. How Much Noise Does a Treadmill Make? 0.1 How Much Noise Does a Treadmill ​​​​​Make? How Much Noise Does a Treadmill ​​​​​Make? The normal noise range for most treadmills makes anywhere from 40 to 60 decibels. Imagine birds chirping in the morning, that's how loud 40 decibels should be. Now imagine low chatter in a restaurant, that's how loud 60 decibels will be. Both of these sounds are clearly apparent and can end up being irritating for you and people around you. Though you should take into consideration that treadmills will all differ in noises depending on the make and brand, so it’s best to do your research first if you want a quieter treadmill. There are other reasons why treadmills tend to create noise while in use, below we will list some of the top tips to minimize these issues. One of the top reasons for treadmills making consistent noises is that maintenance needs to be performed. Bolts and screws might need to be tightened, parts readjusted, or it may need to be sent to the company for repairs. This will usually happen if you use the treadmill often or if you have had it for an extended period of time. It’s best to perform maintenance routinely as this will be the best way to prevent current problems or future problems. The longest you can get away without routinely checking your treadmill is around 2 weeks at max, any long period of time can lead to long-term issues that can impact the amount of noise the treadmill makes. It’s just easier, in the long run, to keep your treadmill in tip-top shape instead of having to fit it once it has accumulated issues that are more complex to fix. Belt issues are going to be the most common reason your treadmill may make noise. Make sure that when you receive your product that you check to make sure the belts are in proper placement as if they aren’t they could cause squeaking noises. Belts can also come loose after an extended period of use, it’s good to check the belt every once in awhile to prevent slippage and also to prevent any extra damage. If you’ve tried the above and still find that a squeaking noise persists then we suggest that you pick up a belt lubricant, as this can sometimes help minimize the friction of the belt as it moves, preventing noises. Motor issues are going to be the next most common issue associated with treadmill noise. 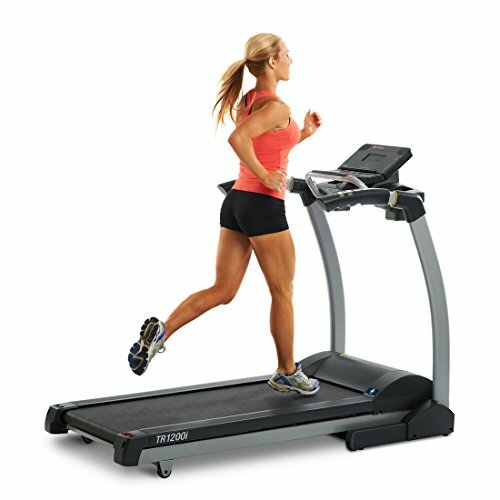 Each treadmill is powered differently, but most of the time you will find treadmill models that are powered by a motor. An easy fix to this issue is to make sure to clean out your motor regularly as it tends to collect dirt particles, dust, lint, and animal hair. This can lead to the motor becoming clogged and emit strange noises. Component issues also can cause noise within treadmills. This is usually uncommon, however, if you notice that your machine is making louder and more frequent noises this can be the underlying cause. A good way to tell if there is a component issue is to do the above three mentioned methods, and if the noises still persist it’s almost guaranteed a component issue. Each treadmill offers different components, so be sure to refer to the manual that came with it on how to clean each component properly. If you can’t find your treadmills manual you can refer to the manufacturer's website or contact their support. Another cause of noises when using the treadmill can be the type of flooring that you have it set on. If the treadmill’s track is located closer to the floor you could risk the chance of it scraping against the floor, this can sometimes happen with treadmills that offer incline options. If you happen to have a treadmill that has incline settings you should consider running a test on the flooring before using it to make sure it doesn't scrape against it. This can sometimes happen if the incline is high while you’re on a carpet, it could even end up pulling small fibers from the carpet. If the treadmill happens to just be noise while you use it you can switch up the type of shoes to reduce the noise when in use. You’ll find that any type of shoe besides workout shoes that offer support tend to create friction and emit noise. Change up the type of shoe you use or try out different kinds of sports shoes, there are even some shoes specifically designed for use on a treadmill. You can now find quiet treadmills for purchase, this is extremely useful if you find yourself not wanting to perform consistent checkups and maintenance. Our number one pick for the quietest treadmill is the Lifespan TR1200i. The lifespan treadmill is easily foldable, which makes it convenient to pick up and carry from room to room. It also saves space in your home or office as it can be conveniently stored in smaller spaces. High-quality motors with a perfect hybrid performance guarantee that your workouts can be consistently high powered. The high-quality motors are also long lasting, meaning that your treadmill can be powerful but boost longevity. The steel framework is included all around the treadmill giving the treadmill lasting durability. The treadmill can support people up to 300 pounds. The Lifespan treadmill comes with 21 preset programs designed by a professional. If you would like to keep track of your progress you can choose to connect a USB drive to the built-in port. If you want additional programs you can get a LifeSpan Fitness Club membership. Your results will be instantly recorded onto the USB through 20-second intervals. After your workout, you can plug your USB into your computer and have instant access to minutes, calories, heart rate, distance, and step count data. The USB data can be uploaded to Lifespan Fitness Club for monitoring purposes. Other exclusive capabilities include built-in safety features, easy console navigation, and a built-in auto stop feature 20 seconds after you step away from the machine. This is one of the few treadmills that has got pedometer that lets you track the steps you have walked or run on the treadmill. The treadmill also comes with an audio center with speakers and an headphone jack. Overall the treadmill is very durable and comes with a two-ply track and plenty of programs to play with. The treadmill's frame and motor comes with lifetime warranty. The parts of the treadmill comes with 3 years of warranty. After you buy the product, within one year the service will be free of cost. The next pick on our list of quiet treadmills is the Progear HCXL 4000. This model is also foldable and transportable, making it easy to store and carry. Extra long handles are included to offer more support as you walk or run, on the side of the handles is a heart pulse sensor. 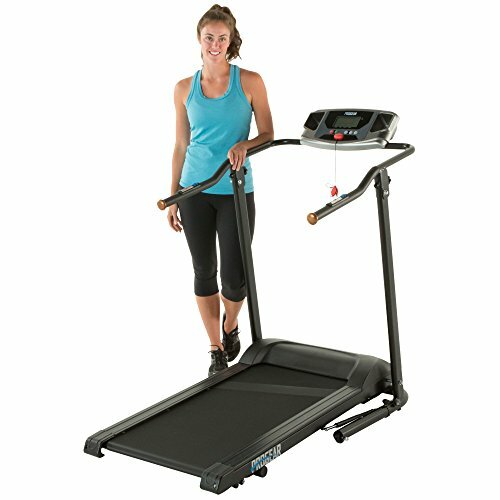 Unlike other treadmills the Progear has a large wide 20-inch treadmill belt, this can help add to the safety of the machine. All of these features help to support a weight capacity of 400 lbs. But one thing to note is that the length of the belt is short. The Progear treadmill comes with speed control that increases in increments of one-tenth a mile, adding up to the maximum speed of four miles per hour. 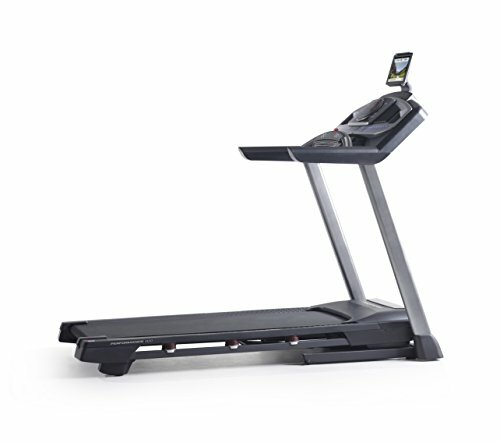 One of the unique features of this treadmill is that you can manually change the incline, however, only 2 positions are available. An LCD display window includes information about elapsed time, total distance walked, calories burned, and also heart rate. The treadmill can be setup with less effort and no need of extra accessories. It is durable and does not wear due to daily usage. The third quiet treadmill we have on our top picks is the Rebel Treadmill 1000 Desk Treadmill. The treadmill is not meant to be used for power workouts. They are ideal to be placed in an office to give you good walking or jogging time to time. With a maximum speed of 2mph, you can't expect to run on this treadmill. The treadmill is very quiet, so that it won't disturb your coworkers. The design of this treadmill is very slim, meaning that it is perfect for compact areas, especially if you plan to use it in your office. It’s easily transportable as it does not weigh a lot and has a compact design. The only downside is that the maximum weight for the Rebel treadmill is at max 250 lbs. The best use for the Rebel is using it with a standing desk or near a tall counter. The Rebel is one of the quietest treadmills on our list, as its compact and simple design reduces the amount of noise emitted while in use. Unlike other treadmills, the controls are located on a compact remote that sits right on your desk. The remote has a fairly simple design, making it easy to use and navigate settings. Other information recorded is the amount of time you’ve been using the machine, the distance you’ve walked or ran, and the current speed you’re using. The fourth quiet treadmill on our list is the Bowflex TC100 TreadClimber Treadmill. The design of the Bowflex isn’t as compact as other treadmills on this list, so don’t expect it to easily store or be moved. 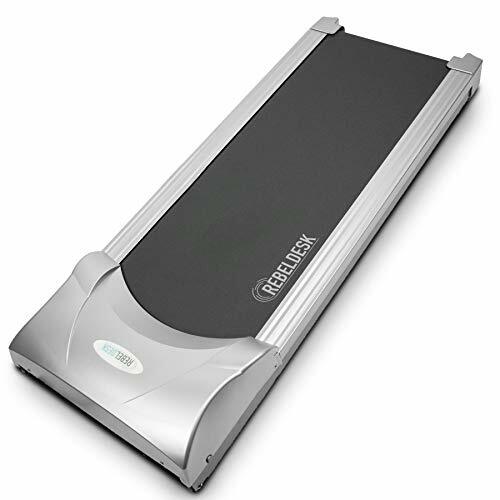 Unlike other treadmills, this treadmill offers a treadclimber feature. Treadclimber features two-step treadmills that move up and down with your foot movements. On the side of the handgrips, there is a heart rate sensor. The treadmill has 3 in 1 design. That means, this can be used as treadmill, elliptical, and also a stair-stepper machine. This treadmill is called walkers' treadmill you can burn 3x more calories than the regular treadmill workout due to the upward sloping workouts. What makes the Bowflex unique is that it offers a water bottle holder, a media shelf/ tablet holder, as well as a built-in USB charging and compatibility. USB compatibility includes the Bowflex Connect which can help track your progress, there is a maximum of 2 different user data that can be stored. The settings can range from speeds of .5 to 4 mph, and tracking features include speed ran, distance, time elapsed, and calories burned. The treadmill also comes with transportation wheels to move it easily. The last quiet treadmill on our list is the ProForm Performance 600i. The design of this treadmill is meant to support your body and give you comfort as you use it. The ProForm offers cushioning throughout the deck area, and has 4 shock absorbers, this gives less pressure on your joints during your run. If you tend to like to run or jog on an incline the ProForm is perfect for you as it offers a 0-12% incline range setting that is powered by motors. The max of 12% incline is uncommon to see in treadmills at this range. This feature allows you to get a good challenging workout for your leg muscles. Powerful electromagnets power the motor, ensuring that even the most intense workouts run smoothly and quietly. If you’re a fan of running, this is definitely going to be our suggested model for you. A unique feature for the ProForm is that you have the option to download the iFit Coach Membership, which gives you VIP access to Google Map Runs, a daily workout routine, and pre-programmed programs that range from beginner to marathon runner. The ProForm offers simple button selection to adjust your settings and the high-quality screen will display your progress. The treadmill comes loaded with 22 workout programs that alter the incline and speed of the treadmill to help you workout effectively. No matter which treadmill you choose on this list, we guarantee that all of these are the best quiet treadmills you’ll find on today’s market. All of our options are built to be portable and most of them can be conveniently stored and used in small areas. Whether you want to walk at your desk or stair step in front of your TV, we have a wide range of different models you can choose from. Nothing is worse than having to jog and run with an annoying symphony of squeaking every few seconds. These treadmills require less maintenance and operate smoothly, ensuring that your experience will not be interrupted by any unpleasant noises. Most of these treadmills also offer a slim design, which reduces some of the problems associated with maintenance. You will most likely not find the buildup of dust or other particles, and the parts will be easy to adjust and clean. 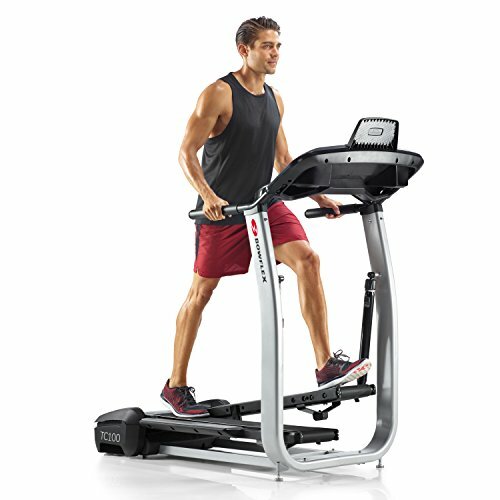 The most unique treadmills that were mentioned in the article are the Bowflex TC100 TreadClimber Treadmill and the ProForm Performance 600i. The reason for this is because the Bowflex offers a unique experience for quiet stair stepping simulation, while also doubling as a treadmill. The ProForm offers the most support and cushioning, but is best used by people who want an intense workout on a weekly basis.